Mel G. Stout packed a lot of living into his 84 years. Born 6 November 1933 in Salt Lake City, Utah to C. Dewey and Viola Allred Stout, he was the seventh of their eight children, all of whom have preceded him in death. What a great family reunion was held when he joined them! He graduated from mortality on 29 December 2017 at home in Mesa, Arizona. In between, he married his childhood sweetheart, LaNeta Jane Owen, in the Salt Lake Temple of The Church of Jesus Christ of Latter-day Saints, and they reared seven children: David (Carolyn), Suellen (Bob) Weiler, Dan (Cynthia), Rebecca (Dan) Cluff, Melvin Gary (deceased), Ann (Dan) Davis, and Jennifer (Brad) Stinocher. 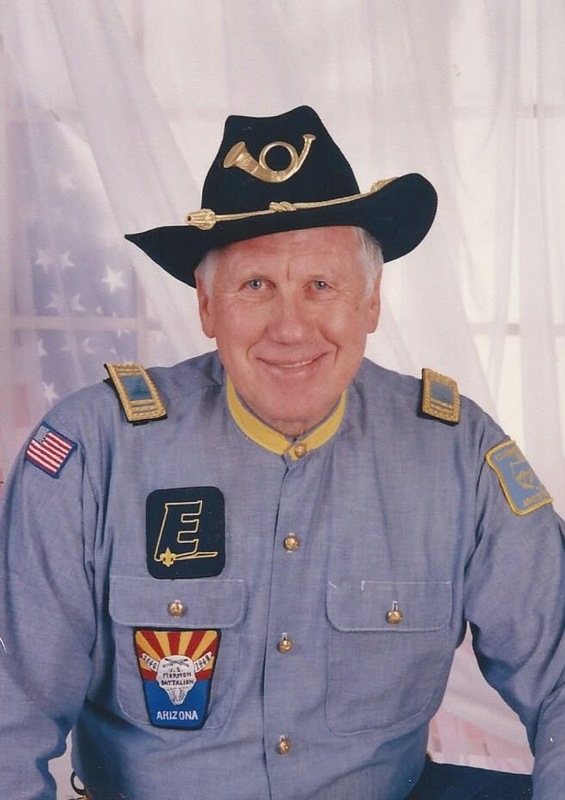 He was a missionary for the LDS Church in the western United States as a young man, and then again in California with his eternal companion after their retirement; they also served several other missions together, blessing many in the community. In addition to his family and his faith, Mel had several other passions, including the Boy Scouts of America, which awarded him the Silver Beaver; he was also an active member of a Mormon Battalion reenactment group. Working with the young men in the area was a source of great joy and fulfillment, and he touched many lives by his untiring service. Mel is survived by his bride of 64 years, six of their children, 45 grandchildren, and 70 plus great-grandchildren, and more on the way. Services will be held at the LDS meetinghouse at 2334 E. Pueblo in Mesa on Wednesday, 3 January 2018 at 10:00 a.m. Interment will be at the City of Mesa Cemetery, 1212 N. Center, Mesa, AZ 85201. Mel is one of the greatest men I have ever known. I am glad that I got to see him a couple of weeks ago. Mel is a great man and friend. He always made me laugh. He always thought of others. He found joy in helping and serving others. He had a love for his Savior Jesus Christ and lived his life in a way that followed Him. His selfless service as a missionary changed my life and the life of my family now and for generations to come. I am grateful for the plan of salvation. We will have a sweet reunion again someday. Mel reconverted my family to the Church of Jesus Christ of Latter Day Saints when he served in Southern California with his wife LaNeta, and became very close to us when I was only 4 years old. I am one of the seven children of that family and always knew him as Grandpa Stout. Mel Stout may not have been my biological Grandfather, but he was and always will be my Grandpa, and I am so very grateful to him and his wife for changing our lives and the lives of generations to come forever. Mel Stout – what an example of our Lord and Savior. Mel and LaNeta were Missionaries assigned to our Ward in 1999 and tought me the Lessons. Two years later I was baptized by Mel and my life was changed forever. Thank you Jay, you will always have a special place in their hearts. Praying the the holy spirit comforts you at this time. What a blessing to know we will one day be reunited with those who have gone on before us! Brother Mel is such a good and sweet man. We love him. And we look forward to seeing his beautiful smiling face again. Vic met Mel when they worked for the Post Office as mail carriers. They loved to play ping-pong together. We had a table set up in our basement and they had some pretty roudy games. Mel was Vic’s mentor in the game of chess. It was a day to celebrate when Vic won his first game from Mel! When Mel changed jobs and went to work for Western Airlines, he let Vic know when there was an opening. Vic applied and got the job, so they worked together for the Airlines for a number of years. We were sad when it became necessary for Mel to move to a warmer climate. We enjoyed our time together on picnics and family outings. Our families were so close and we enjoyed our time with the Stouts. Mel and LaNeta just go together. It is hard to say one name without the other. It was always a joy to hear them sing together. Their voices blended together just as their lives have. They were fun to be around and Mel was a great story teller. Both funny and spiritual. There was no doubt in your mind that he loved the Lord and that he had a strong testimony. Mel will be greatly missed, but as has been mentioned, there is a wonderful reunion going on with his parents, siblings, son and others. We love your family so much and pray for your well being and that you may have that special peace that the Savior alone can give. What an awesome man Brother Mel was we were home teaching companions for about 5 years and I learned so much from him over that time. When we moved he continued to send me his wonderful home teaching messages. Brother and Sister Mel always treated my whole family with love and respect and we tried to do that with them. Please give you Mom a hug from are family to her. We had so much fun with uncle Mel and aunt LaNeta when we were living in Arizona. Can’t wait until we can sit around laughing and joking again, but I think we will wait. We too love Mel and LaNeta. Mel was our son’s 11 year old Scout leader. Each one loved him. He was even a first time home teacher copanion to one of them. He loved and tutored him in home teaching. Great memories! Sorry that we will be serving in the Temple on Wednesday morning. Sincere condolences go out to the family. May the promise found at Acts 24:15 and Psalm 37:29 provide you with a measure of comfort and hope at this difficult time. Thank you for letting us know. Mel brought me the greatest gift possible. He brought the gospel to my parent Olly and Birdie Higinbotham. He baptized them and they remained friends for many years. I remember the time I spent with him and his family when I was young. The gospel is my life!!! How could I ever express enough love to this man who showed us the way to our Savior. I will forever be indebted to him and look forward to the day I can hug him and thank him in person again. Just so you know, both of my son’s went on Missions. Between them they brought the gospel to over 70 families. All four of my children were married in the temple and are active. We have 10 grandchildren that hopefully will continue the work. He has impacted many!! As a Stout relation, I am sorry to see this world deprived of a good and honest man, good-looking and witty. Heaven is blessed. It’s only fair that we let him go home. Love goes out to the family he leaves behind. May God’s comforter bring you peace and healing. Mel taught my parents the gospel when my older brother was a baby. When my mother, Birdie Higinbotham answered the door with my brother in her arms one day when Mel & his companion were out tracting, Mel said he had a baby at home about the same age. My mother just had to know what was so important that a father would leave his tiny baby at home. As a result she & my Father Oliver got baptized and went to the Temple to be sealed along with my brother Dan. Because of this my sister Ann & I were born in the Covenant and have had the privilege of having the Gospel in our lives since birth. How does one adequately express gratitude for this great man’s service? Not only did he bring the Gospel into our lives but he remained a true friend to my parents unitl their deaths, and now he’s reunited with them once more on the other side of the veil. I can just imagine the joy of that reunion! I know you are all feeling the pain of losing (for a short time) such a wonderful example of a husband, father, relative and friends. I know without question that Uncle Mel has prepared the path for his loved ones and his example helps us all to press on, being happy to follow the Savior as Uncle Mel did. I am so sorry we did not make the funeral but we are thinking and talking about how his passing is in itself a wonderful confirmation of the Plan of Happiness. We love you all and pray for your comfort during this huge change. On my families way home from Germany, we stopped in Colorado to see Elder (Uncle) Stout – Seeing him being so happy interacting with people while serving as a missionary made me want to serve as a missionary also. Over the years, Uncle Mel would send me neat pictures of airplanes doing extra ordinary flying He seemed to know just what I needed to “get with it”. I love you Uncle Mel and I know you are happy with being with your extended family but I know you will not feel complete until you are with your precious wife Aunt LaNeta. I was in the car when Mel was pulled over by the police for being a bank robber. On the way home from baptizing my parents, with my parents and Elder Stout and his companion in the car, we were stopped by the police. The car evidently matched the description of a bank robbery getaway car. The policeman was surprised to find that the suitcase in the trunk contained not cash, but wet baptismal clothes. After living such a good life, I’m sure he wasn’t convicted and sent to (Spirit) prison. I will forever be grateful to Mel for bringing my family the gospel. It has made all the difference for me and my family. What a giant among men, that is Mel Stout. We had the privilege of visiting their home as home teachers prior to our serving a mission in Salt Lake Jul 2014 to May of 2016. When we started the mission process two of the first people we talked to was Mel and La Neta, as we had talked with them on more than one occasion about their mission experiences as a couple. They were as excited as we were. They made us feel so welcome whenever we were in their home. Mel is very proud of his missionary map in the hall of their and would show it to us and update us many times. He is very proud of his posterity and rightfully so. LaNeta taught us how to filet and peel a grapefruit. I remember many lively and spirited discussions that we had in our High Priest Group classes on Sundays. While we were serving our mission the stake had some ward boundary changes and the Stouts were in a different ward upon our return. He has a quick wit and a wicked sense of humor on occasion. He will keep the spirit world on its toes. He loved to run when he was younger and now can do so without the springs on his shoes. As we have read others comments we can see we have my seen the tip of the iceberg as to the influence for good this man had on those he came in contact with. He will not be forgotten. Till we meet again Brother Stoutscout. I met Mel when he and LaNeta served at the Institute (Mesa High School Seminary Building) on Thursday evenings many years ago. He was an immediate attraction for me due to his sense of humor and stories of Church Service. I shall miss him tremendously!!!!! He was one that you just couldn’t help but love and listen to. He could keep you in stitches one minute and crying the next telling stories. I shall miss him tremendously and wish my heartfelt condolences to LaNeta and family. He is a good one and I can just hear the Lord saying to him: “Well done thou good and faithful servant”… I shall try and keep in touch a little LaNeta as the two of you are “keepers” for friends. My love and blessings. Sorry, I just found about the passing and funeral this late afternoon so I missed the funeral. Cathy and I live across the street from Mel and LaNeta for 30 years plus. Mel was a good friend and neighbor. I served with Mel in the bishopric with Bishop Moody. I am sadden by his passing. He cared and loved all who knew him. It is hard when you lose a spouse. My thoughts and prayers are with LaNeta and family. My deepest condolences to the family at this difficult time. I hope the words at Rev 21:4 bring you comfort. It tells of a time soon when there will be no more sickness, pain or death. Mel was always smiling and cheerful in his dealings with me and my family. Great guy and a great scouter. So sorry for your loss. I have many childhood memories of being in your parents’ home. May the Lord bless all of your family with peace at this time.